Teachers truly are miracle workers. Not only do they work hard to turn around struggling students and help exceptional students succeed, but they often do it with a limited budget and a lack of quality materials. That’s why sites like Pinterest are full of ideas for turning household goods and recyclables into fun classroom projects. Sometimes, however, teachers need more than recycled goods. That’s when money – and a bit of goodwill – comes into play. 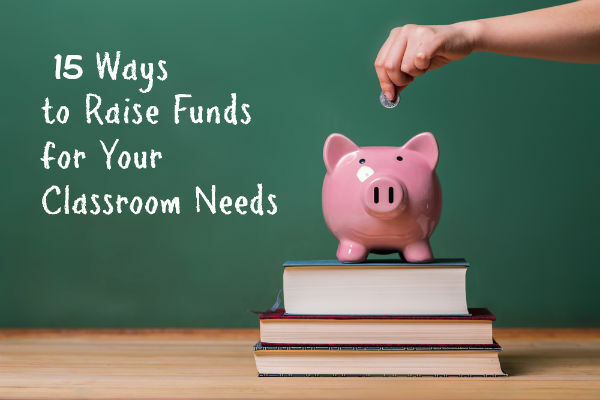 If you desperately need funding for your classroom, we’re here to help with a list of websites and other resources to provide the money you need. Note: Before posting any fundraisers for your classroom, check your school or district guidelines. Some districts require that teachers receive approval from administration or the board before fundraising. DonorsChoose.org gives teachers the opportunity to post their classroom needs and allows others to contribute to those needs. Friends, family, and community members who know about the project can contribute, but the project will also be visible to a wealth of donors who regularly work with the site to help fund classroom projects. While teachers can request virtually anything, projects with lower costs, longer deadlines, and clear academic goals have the highest funding rates. Once teachers receive the materials from DonorsChoose, they must fill out a documentation and thank you package to send to donors. Successfully completing the documentation earns teachers more points to submit new project requests. TeacherLists.com gives teachers a place to post their classroom supply lists so parents can easily access them. While the goal of the site is just to share school supply lists, teachers can also create lists for other reasons, giving parents and other school supporters gift ideas for Christmas or Teacher Appreciation Week. Teachers can also win free supplies by referring other teachers to the site. For example, getting one new teacher to sign up earns teachers a selection of Wet Ones hand sanitizing wipes. Classwish offers multiple ways for teachers to get resources for their classrooms. At the basic level, teachers create wish lists and share those lists with potential donors to help get the items and the funds they need. The site also helps schools partner with local businesses to create workplace giving or matching gift programs. Parents, friends, and others can also send greeting card gift certificates to help meet their classroom needs. Through Adopt-a-Classroom teachers can get their classroom needs in the hands of donors who want to help meet those needs. Similar to DonorsChoose, teachers post their latest projects and other classroom needs to their Adopt-A-Classroom profile. They can then share those needs through social media or promote their page within the community to get people to donate. Donors who regularly visit the site can also search for different teachers’ needs and donate. With DigitalWish teachers can ask for donations to help bring technology into the classroom. While teachers may not receive new computers or high-end equipment, they can receive cool software and smaller digital items, such as handheld video cameras, to help bring their classrooms into the 21st century. The site also regularly offers grants to help teachers get specific products and works with companies to provide deep discounts for teachers. When people buy office supplies through Chalkfly, a percentage of their purchase is given to a teacher of their choice in the form of Chalkfly cash. This cash allows teachers to use Chalkfly to purchase supplies for their classrooms. So teachers can work with local businesses, parents, family, and friends to have them purchase some of their basic office supplies from Chalkfly to help them earn money for their classrooms. Teachers can also earn money back from their own purchases. Jumping on the crowdfunding bandwagon, PledgeCents helps teachers use the power of crowdfunding to fund their classroom needs. After setting up a project, teachers share it through social media sites and encourage others to share it as well. As the project starts to go viral, more and more people can donate to it, helping teachers reach their goals a few dollars at a time. Since the goal of PledgeCents is to get others involved, teachers should not be shy about asking for donations and should work hard to present a compelling case to get their needs met. While Freecycle might not help you meet specific classroom needs, it could help you find free resources for your classroom. On Freecycle, people give away things for free. By connecting with a local group, you could find free classroom furniture, boxes and other random objects for craft projects, or even request specific items for a classroom project. Getting some items for free could help free up money in the budget for other classroom supplies. One way to get extra funds for the classroom is just to make extra money. TeachersPayTeachers allows teachers to sell lesson plans, worksheets, and other educational materials. By adding and promoting their materials, teachers can make a little extra cash to use in the classroom. They’ll also find free lesson plans, worksheets, and other resources to use with their students. While teachers can’t start campaigns on DoSomething.org, their students can. Designed to help teens and young adults fund their causes, teachers can help students get started using DoSomething.org. Through the site, students can find funding and support for school fundraisers, community service projects, and other ideas designed to help others and make the world a better place. If students don’t have their own cause, teachers can help them find an existing cause to support. This works great for character education classes and school clubs. If you have an Amazon account, you can set up a wish list full of items you need in your classroom through Amazon Lists. Share the link with parents, friends, or even total strangers and ask them to purchase something from your list. Items purchased from your list can be shipped directly to you at the address you select. The address will be hidden from senders so safety is not an issue. GoFundMe allows teachers to post fundraisers for their classrooms on its cloud-funding platform. The site includes categories for teachers, teams and clubs, and students and parents. SimpleFund gives parents and students a chance to raise funds for schools by using their cell phones. They earn funds by reading articles, watching videos, and downloading apps. Class Tag helps you raise money as you communicate with parents. Every time you engage with parents, you earn coins within the program. Those coins can be redeemed for classroom supplies. Shoparoo uses grocery receipts to help schools earn money. Parents simply download the app and upload their receipts every time they shop. Then the school earns money. What other websites, resources, or methods have you used to help fund your classroom needs?